Coloured bricks fp52.2.3, a photo by Boroondara Libraries on Flickr. One of the fascinating things about walking about Hawthorn is the beautiful brickwork that can be seen on buildings and in the case above on a fence in Oxley Road, Hawthorn. Hawthorn had a number of busy brickworks in the nineteenth century, some of which were still functioning well into the twentieth century. This is a whole separate topic of fascination. This post is really about the theme of colour as we have submitted the above photo into the Flickr Friday Photos 2012 theme for this week: Colours. There are many examples of colourful brickwork to be seen in domestic architecture in Hawthorn but two buildings absolutely stand out on the horizon and they are both churches. The Hawthorn Presbyterian Church in Glenferrie Road Hawthorn is shown above. This photo was taken on a very dull wintery day in summer but even so you can see how the building's colours stand out against the sky. It is even more stunning against a bright blue summer sky. The first Presbyterian Church was built in Hawthorn in 1865 on this site and this building was opened in 1891. Like many of Hawthorn's churches, the Presbyterian Church relied heavily on local patronage. In the case of the Presbyterian Church members included Dugald McDougall, a partner in Sands & McDougall's stationers who were the publishers of the Sands & McDougall Directories, Andrew Murray, former editor of the Argus, Thomas Everist, surveyor and owner of "Spring Hill", James Fergusson, later MLA, and David Swan of Rathmines Road, father of Hawthorn Councillor James Swan. The other, and perhaps more obvious building on the horizon as it can be seen for miles around is the Oxley Road Uniting Church, formerly the Oxley Road Methodist Church. This building is part of a complex which comprises of church, Sunday school, parsonage, and caretaker's cottage and was constructed between 1888 and 1890 from the designs of Alfred Dunn. 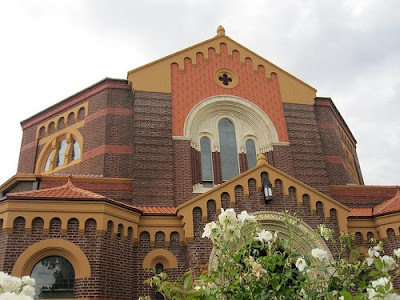 This church is of significance as the best example of Lombardic Romanesque church design in Australia, for the major complex amongst the Wesleyan establishments in Australia and for the major work of architect Dunn. It is also significant as a key local landmark in Hawthorn. The photo here of the tower gives a good impression of the colours to be found in the brickwork and the architecture generally. These just stand out for passers by. Next time you are in Hawthorn get out of your car and walk around for a bit. Look at the brickwork to be found in the houses and wonder at the colours and designs that have been created out of the colours. But above all, stop and look at these two nineteenth century churches which are such great examples of the colours to be found in bricks.